Before we dive in, just a heads up that my monthly post is up over at Publishing Crawl, where I’m talking about ways to serve your story. 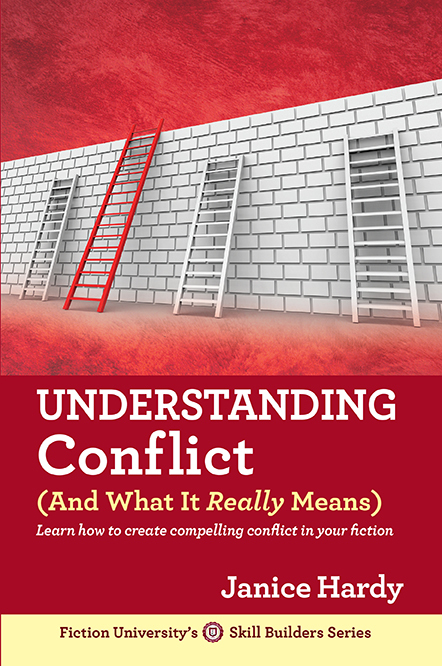 Agent Donald Maas once said, “You can never have too much conflict.” He’s not alone in this thinking, and “not enough conflict” is a common reason manuscripts get rejected. Even novels with strong plots and solid core conflicts can earn a, “sorry, not for me,” because the conflict comes in dribs and drabs and there's no tension on every page or in every scene. But there’s an easy fix for this. What do the other characters want? It seems simple, but what often holds a scene back is that non-POV characters know what the protagonist wants (because the author does) so they just go along with it or don’t try all that hard to stop it. Friends of the protagonist are on her side and support whatever she’s doing and how she’s doing it. Everyone is always on the same page because that's where the plot is going, so even when the bad guys are trying to stop the protagonist, it doesn't always feel like their heart is in it. Let’s say we have a scene with three people at a restaurant—Kate, the protagonist; Robert, the husband; and Brenda, the waitress. Kate and Robert have been having trouble getting along lately and things are strained between them. They’re having dinner at the restaurant where Robert proposed years ago. Kate wants to ask Robert to start going to marriage counseling, and by the end of the scene, he’ll agree and move the plot forward. The scene will likely play out with some conflict, as Kate is nervous about asking and Robert will be hesitant and not want to do it right away. This is a scene that will show these two don't always agree, but maybe there's still hope. It’s easy to see how a scene like this could end exactly as Kate wants it to—she gets her way and they go to counseling. The author knows this is where the plot is going and this scene is just a way to get it there. There’s also a good chance that this scene won’t have a lot of conflict making readers eager to see what happens. Going to counseling is a predictable conclusion so they expect it to end that way. They might even be looking ahead already to see what happens once they get to the counselor's office. What if we forget what Kate wants for a minute and ask what Robert wants. And don’t just give him a weak goal that helps Kate get her way—give him a real goal that fits who he is and also opposes what Kate wants. Let’s say Robert wants a divorce. This is the opposite of what Kate wants, and it gives Robert motivation for not wanting to go to counseling. Flesh it out further and decide why he wants the divorce versus trying to work things out. Maybe he’s met someone else, or he doesn’t like who Kate has become, or he’s just tired of trying to be the man she thinks he is all the time. Whatever his reasons, make them personal to him and separate from what Kate wants. Now the scene takes on a new dynamic, because as we write it, we know exactly why Robert is balking and what he might say to reject Kate’s idea. He’ll hem and haw, trying to talk her out of it and finally have to either give in and tell her he wants a divorce, or cave in and do what she wants even though it's not what he wants. It might even enrich the plot because now the outcome isn’t so certain. Even if he agrees to counseling, readers know there's more going on here because of what was revealed (or suggested) in this improved scene. But let’s not forget Brenda, the waitress. What does she want? Brenda wants to get out of work early because she has a final exam the next day she’s barely studied for. This is minor in the big picture of the plot, and honesty, no one will care what Brenda-the-walk-on-character wants. She’s a nobody, but she’s in the scene and you can use her to raise tensions and add conflict by thinking about what she wants. She might rush them to order, sparking Robert’s annoying impatient side that Kate wishes he’d work on. She might bring Kate’s well-done steak out too soon and cause her to send it back, something that always drives Robert crazy. She might be distracted and let them sit instead of checking back on them, giving them time to remember the night they got engaged and reconsider where they go from here. She might show up as lousy times and make both Kate and Robert uncomfortable. She’s a small character, but she has the ability to put pressure on an already tense situation and make it worse. Knowing what every character in a scene wants doesn’t mean you have to explain or reveal that goal across to the reader, though. It’s a little trick to remind you that people act independently of each other, and that applies to novels as well as life. Giving each character something to strive for can add a layer of interest to a scene, and turn predictable into compelling. Do your characters have their own goals or are they just supporting the protagonist? Most welcome, I'm sop glad you found your way here. It makes my day to hear the site helped someone, so thanks! This is exactly what I need to read about (and thanks for the further links) because my novel cries for these small conflicts. I'm an agreeable person, and sadly, so are too many of my characters. This is very helpful. This is such an immediately applicable tip Janice, especially the ideas about the waitress, thanks! Happy to help. Sometimes small things can make or break a scene, and it's funny how often a little change affects how the scene feels. This is such a great reminder for me. I sometimes focus solely on the protag and forget this. I've been digging around for insights on improving my writing at the scene level (after getting overwhelmed trying to improve it on the micro or macro level) and stumbled across this post. I can't thank you enough for including a simple digestible example! Too much writing advice is purely theoretical and lacking in actual examples of HOW to do something not just WHAT to do. Armed with your advice, I'm off to tackle the first few chapters of my manuscript to see where and how I might have let the other characters slack off on their convictions and motivations. Thank you for this!! Most welcome, I'm glad it helped :) Good luck on the revision!